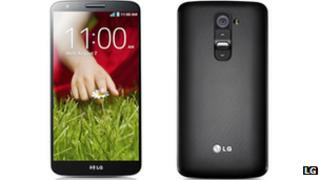 LG has cancelled a series of events promoting the handset as a result of the incident in Seoul on Friday. LG has taken responsibility for the situation and said it would cover related medical costs. "LG Electronics deeply regrets that a number of Korean participants were injured during an outdoor promotional event in Seoul, Korea," a statement from the firm said. The company added that other planned events had been called off because of safety concerns. LG released 100 helium balloons, each with a free smartphone voucher, at the so-called G in the Cloud event, which took place in an outdoor park in the South Korean capital city. The phones, which sell for KRW 950,000 in South Korea ($851; £550), would be given to people in possession of the voucher, the company said. Customers arrived with BB guns to shoot down the balloons and surged forward when they were released. One person carried a pointed staff to the event. One regional TV channel has dubbed the scrum "World War G" - a comparison to the film World War Z in which zombies scramble over each other to climb over a wall. The handset was released in New York last week, after weeks of build-up on social media. It is expected to be available globally with more than 130 carriers within several weeks.